Often, snoring is a sign of a much more serious condition known as sleep apnoea. Sleep apnoea is an airway obstruction that occurs when throat muscles relax & you stop breathing at night. The obstruction results in lower levels of oxygen in the blood. It affects more than 3 in 10 men and almost 2 in every 10 women. Most are not aware they have the condition. Sleep apnoea is a major contributing factor to heart disease and dementia. Sleep apnoea sufferers often experience elevated blood pressure which is a serious risk factor for heart disease and stroke. Oxygen deprivation that occurs during sleep apnoea has recently been shown to affect memory function and interferes with brain's ability to learn new information. Whilst there is no cure for dementia, treating sleep apnoea has been reported to help prevent cognitive decline before it is too late. 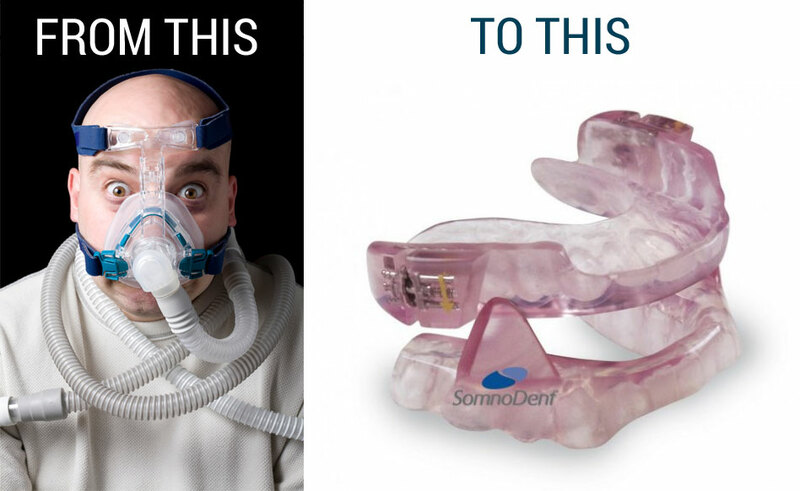 Even if you only have mild sleep apnoea, an oral appliance will result in reduction or cessation of snoring. Apart from the benefits to your health, this could be a special gift to your partner! The CPAP (Continuous Positive Air Pressure) device has been the gold standard of treatment of moderate to severe sleep apnoea for many years. Although effective, the device is bulky and uncomfortable to wear and has low patient acceptance. If you have sleep apnoea and are frustrated with or cannot wear your CPAP device, we can offer alternative treatment. At New Millennium Dental, we can custom-fit you with an appliance to wear at night. Similar to an orthodontic retainer and a nightguard, a small removable appliance is fitted over your top and bottom teeth. It gently realigns your tongue and jaw to open your airway and lets more air flow into your lungs while you sleep. Known as the mandibular advancement splint, the device is easy to place and remove, easy to clean and is convenient for travel. It is comfortable to wear and has shown great success in sleep apnoea treatment. Tired of forgetfulness, depression, morning headaches? Or complaining partner that you are snoring? Call New Millennium Dental on 9557 0957 for a consultation and get your mandibular advancement splint today.